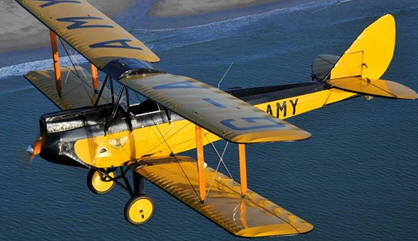 November 28, 2012 – Bonhams which a privately owned British auction house and one of the world's oldest and largest auctioneers of fine art and antiques will auction off the 1929 De Havilland DH 60GMW Gipsy Moth bi-plane that flew in the Oscar winning Hollywood blockbuster 'Out of Africa'. Out of Africa was a 1985 American romantic drama film directed and produced by Sydney Pollack and starring Robert Redford and Meryl Streep. The film was based loosely on the autobiographical book Out of Africa written by Isak Dinesen which was published in 1937. The film portrays a story of a Dutch woman who travels to Africa to run a coffee growing plantation. A more memorable moment of the film was when Redford and Meryl Streep flew the Gipsy Moth plane over the Kenyan Savannah. The film won 28 film awards including seven Oscars in the year of its release. The de Havilland DH 60 Moth was a 1920s British two-seat touring and training aircraft that was developed into a series of aircraft by the de Havilland Aircraft Company. This aircraft will go on auction by Bonhams at the Grand Palais in Paris, France, from 6th to 7th February 2013, where bidding is expected to be in excess of US$180,000. The 1929 American Moth Corporation De Havilland 60GMW Gipsy Moth is offered in excellent condition with a permit to fly. The DH-60 Moth measures 24ft long by nearly 9ft high, and has a 30 foot wingspan. It is capable of a maximum speed of 105 MPH. It still wears its yellow-and-black livery and registration G-AAMY, in homage to pioneering English aviatrix Amy Johnson. Amy Johnson CBE, born on July 1, 1903 was a pioneering English aviatrix. Flying solo or with her husband, Jim Mollison, Johnson set numerous long distance records during the 1930s. Johnson flew in the Second World War as a part of the Air Transport Auxiliary (ATA) where she died during a ferry flight. In 1940, during the Second World War, Johnson joined the newly formed ATA, whose job was to transport Royal Air Force aircraft around the country and rose to First Officer. On January 5, 1941, while flying an Airspeed Oxford for the Air Transport Auxiliary from Blackpool to RAF Kidlington near Oxford, Johnson went off course in adverse weather conditions. Reportedly out of fuel, she bailed out as her aircraft crashed into the Thames Estuary. The crew of the HMS Haslemere spotted her parachute coming down and although she was seen alive in the water, a rescue attempt failed and she drowned. Her body was never recovered. The incident also led to the death of her would-be rescuer, Lt Cmdr Walter Fletcher of HMS Haslemere.